Looking for a detailed review of Pet Armor for your cat or dog? Whether this is your first flea outbreak or your fifteenth, you know that this type of infestation needs to be nipped in the bud FAST. Fleas multiply rapidly and can take over almost every tiny space in your home with their eggs and larvae, so it's important to find the best protection necessary when you're treating the fleas you see on your cat or dog. If you've stumbled across PetArmor, you may be wondering how effective it is, are there any side effects, and how it compares to other leading brands like Frontline and K9 Advantix. Keep reading for the full scoop! PetArmor produces many products with different formulations for both cats and dogs. They have a regular "PetArmor" brand and a more expensive "PetArmor Plus" brand of flea treatments. The main difference between the "Plus" and the "Normal" is the added ingredient S-Methoprene, which used to kill insects that survive the first application of insecticide as well as kill the fleas and eggs (the normal version doesn't kill fleas and eggs). The main active ingredient in all PetArmor products Fipronil. So when you're looking at both products and wondering what the differences are, that's it. The major appeal with this brand is cost. Think of this product as a "store brand" in the midst of a myriad of name brands. By presenting a generic product with the same premise as the big guys, many pet owners feel compelled to invest in this product over the bigger names. Affordability factor aside, this product is unfortunately lacking in that flea killing punch. It claims to be a cheaper alternative with all the same ingredients as Frontline (check the packaging). While it may work for some, the overall customer satisfaction level hovers around 50-60% across many popular review outlets, which corresponds with our research. Many users report that the fleas are initially killed, but return in droves before the next scheduled treatment. PetArmor is a budget friendly flea and tick treatment with a few drawbacks. The best way to make an informed decision is to weigh your options. Here, we've listed some of the major pros and cons to buying and using PetArmor. There are reports that the product does not spread throughout your pet's body after application resulting in a incomplete flea defense. Not all flea treatments are created equal. Take a look at some of the features of this product in order to better familiarize yourself with the product you're buying. This is a standard flea drop: the anti-flea serum is contained in a small tube and easy to use. Simply apply drops of the liquid to the spine of the dog after parting its fur down the middle to expose the skin. The active ingredient will release through the top layer of your dog’s skin and kill parasitic insects, then work to prevent new parasites from jumping onto your dog. Like mentioned earlier, the "Plus" version has the added benefit of being able to kill baby fleas and interrupt the life-cycle of fleas. It costs more money, but if you are going to grab some of this product, we'd recommend going with the plus brand. This product has the same look and feel of the name-brand products with a much smaller price tag. You can give your dog the same shield against fleas that you'll get with a big-name product, but you'll pay substantially less. Other flea and tick solutions will probably run your between $20-$40 bucks (and probably a stop at the vet). PetArmor markets their product by saying you won't need to go to the vet and you can just use their product, which is a bold claim. This company specializes in flea drops and serums for different-sized dogs, so many customers have usually only tried one of their products. In any case, the results are mostly positive and customers are generally happy with this company and its product; grateful for a way to get the name-brand results at a store-brand price. One thing that we liked is that PetArmor has a pretty good return policy, and they have even dedicated a page to it on their website in case customers aren't happy with their product. One thing we didn't like is that PetArmor and PetArmor Plus were named in a class action lawsuit against Frontline Plus as well as being entangled in a potential recall that almost forced them to withdraw their PetArmor products from a multitude of retail chains. It looks like ultimately nothing happened, but it is always something to be aware of when deciding to purchase or not. Fipronil, which is a top veterinarian-recommended flea killer used in many products (such as Frontline, which has relatively high reviews), but each product has a different formulation. Because each product has a different "mix" of chemicals and insecticides, your results vary despite the active ingredient being the same. For pesticide products on the market, you'll often notice that they have the same ingredients. 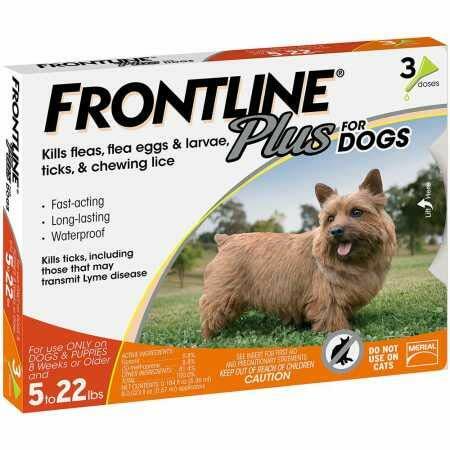 For example, both Frontline and PetArmor both use Fipronil to kill bugs, but they're different products, what gives? Well the main differences are due to the "inactive ingredients" or the other stuff in the product not listed. These could be baits or other chemicals needed to make your bug problem go away. 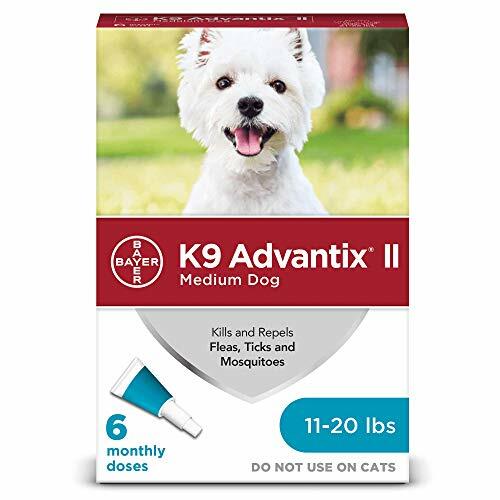 We'll also note that the active ingredient in K9 Advantix II for dogs and Advantage II for cats both contain Imidacloprid, which has been rated higher in a number of clinical studies as a more effective flea remedy, which is something to keep in mind. Like many other flea drops, this medication is very easy to apply, in theory. The key to a successful application is to ensure that your dog will stay still long enough to place the required amount of serum in the skin. Here's a quick video showing how it's done. As with most pest killing product we review here at Pest Strategies, It’s important to keep this product on a high shelf, away from the hands of kids. This product can cause harm if it’s eaten or gets squirted into the eyes. Be sure to purchase the correct formula that corresponds with your dog’s weight; otherwise, the serum may be too strong for your dog’s skin and can cause pain upon application. This product has more happy customers than dissatisfied ones, but there are still enough negative experiences to make a person think twice about purchasing this product. Through our research Pet Armor is only half-effective at best, and that we recommend instead to splurge on a name-brand product rather than risk the possibility of fleas returning to your pet and your home. One of the more expensive flea treatments on the market for dogs is K9 Advantix II. Permethrin: An active ingredient included in many mosquito control programs. Imidacloprid: This is the main ingredient and it disrupts the nervous system of the bugs it comes into contact with with high potency. This formulation is the real deal cutting down most flea issues and effectively disrupting their life-cycle. When comparing K9 Advamtix against PetArmor, they are both applied in similar ways, but the punch K9 brings is just stronger although you'll definitely pay a bit more for it. For a full review of K9 Advantix II, click here. The next product we'll compare PetArmor to has to be Frontline Plus. Given their constant battles between the two brands, it only makes sense to compare them. To the average pet owner, both brands have very similar ingredients, but when it comes to actual results there are some reported differences. The main differences are in the inactive ingredients, which we as the public do not have access too. As with most pet products, your results will vary from person to person and pet to pet, therefore it is hard to do a true comparison between these two products because they contain the same active ingredients. For Frontline, people have found success when specifically dealing with flea issues (not tick issues). Also there aren't as many reported cases of dogs or cats getting side effects after application. Taking all of this into consideration, we're slightly leaning toward Frontline Plus for this comparison. If you have the budget, go Frontline, but if you're tight on funds, try PetArmor but monitory closely for any reactions from your pet. Unlike PetArmor, which is a serum based flea treatment, Adam's is a shampoo made of coconut oils, aloe, and other natural ingredients to bathe your pet and make the coat soft. 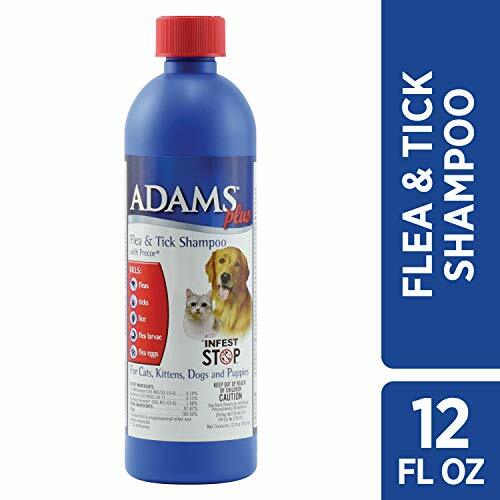 The primary parasite killer contained in Adams Plus Flea and Tick Shampoo is Precor, which is an insect growth regulator to kill adult fleas as well as eggs and larvae. PetArmor is not a cleaning agent, just a singular product, so this shampoo actually kills two birds with one stone: bathing your pet and ridding the fleas at the same time. ​We like Adam's a bit more as this product is a bit more affordable, can be used on cats or dogs, and is capable of killing fleas at all parts of the life-cycle. 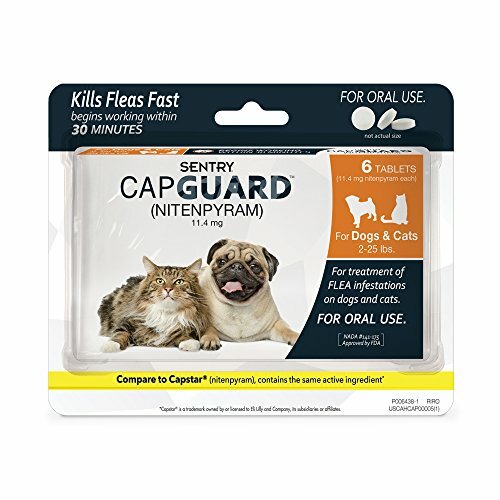 Capguard is the generic form of Capstar, which is flea treatment in a tablet form. As with most "generic" products there is a slight risk that you would not get as much benefit as you world from the name brand. Thankfully, we did not find that to be the case and Capguard works just as well as Capstar. They are meant to be taken and swallowed by dogs in order to work. Since they are tablets, they can be a little bit more difficult to get down with fussy dogs. On the other hand, we've also found that some dog owners have a hard time holding their dogs down and pills work better. It just depends on your dog's personality. Also, since these are pills that enter you pet’s bloodstream, they can work significantly faster. In as little as 30 minutes, an animal’s body will begin to see the effects of the treatment working. ​The only downside to Capguard is that the active ingredient in the product is Nitenpyram, which is good, but only lasts 24 hours. Assuming you haven't taken steps to eliminate the flea problem in and around your home, they'll just come back. That being said, the winner here is PetArmor Plus as it is a more longer lasting solution. PetArmor has gained traction in the marketplace for its “store-brand”-esque marketing tactics. The packaging claims that the solution uses the same active ingredient as Frontline Plus, the top name-brand competitor, and at a lower price point than you’d pay for one of the top contenders on the market. Unfortunately, to get to that lower price point with their cheapest product, PetArmor removes key ingredients needed to effectively interrupt the flea life cycle. If you want that capability, then you'll need to opt for the more expensive variation, PetArmor Plus. 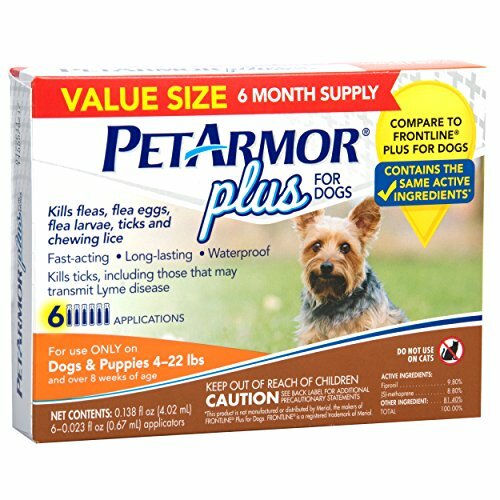 If you’re short on funds but need to save your pet from a flea and tick problem, PetArmor is a budget friendly solution. Although it contains the same active ingredients as Frontline Plus, it has a different mixture of inactive ingredients, which have some negative effects on pets. If you want to buy PetArmor, our recommendation would be to apply it but monitor your pet closely for any negative effects. What are the side effects from pet armor plus? Used for first time on my 9lb yorkie and she is digging out clumps of hair no fleas found on her ever so that is not the reason. Also she began having diarrhea? I used pet armor for yrs. on all my cats and dogs and strays(regular strays) and never had problems ,but last 2-3yrs. felt pet armor wasnt working,so moved to pet armor plus.Seems to me during the first 2-3 months of warm weather ,the fleas are much of a problem and battle some with them.now late July,early Aug. 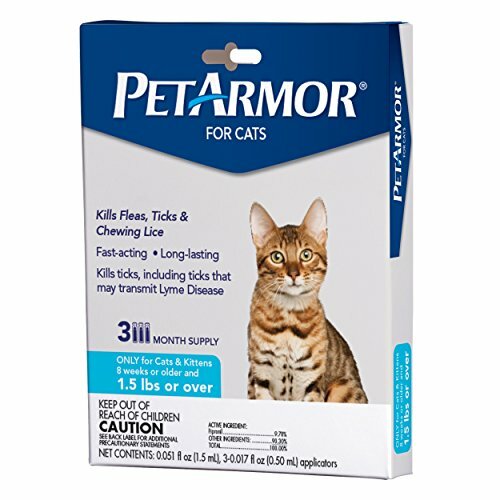 Hoping the flea problem will die using pet armor plus,if not I will be forced to try something more expensive.I cant afford the expensive to help the regular strays That I have cared for for many yrs. ,they would end up suffering with fleas and that would be sad for me.time will tell for me.I think if a cat /dog has allergy problems,no matter if vet,you give them the meds. it will still have the same outcome.But everyone has to make sure positively how much their pets weight 100% and give correct dosing as instructed and watch closely when first time used on that animal.I try to keep all from licking till it dries also knock on wood have not had any problems. Thanks for the comment and some information regarding your experience with Pet Armor. You’re 100% right in making sure you give the right amount of treatment based on the dog’s weight. That is why companies like Bayer and Advantix create different products for different dog weights. It’s not because they want to make more money (although they want to) it’s because of the amount of blood, tissue, muscle, and overall size of the dog will require different potencies to be effective without hurting them. If Pet Armor doesn’t work, I’d recommend trying a Bayer Seresto dog collar. Here’s our guide on how to pick one.